The first step on any new journey can be challenging, but we will do out very best to help you to not only take it with confidence, but also continue on the right path. Use HMEs more (or for the first time) to minimize coughing. Take better care of the skin around the stoma. 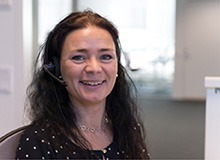 Together with one of our experienced customer service representatives, we will go through exactly what you want to achieve and put together a plan to reach those goals. There is no such thing as a “typical” program, but we often see the best results when users stick to program for 1-2 months. At this point, we can review progress and decide on next steps. Do you want to join the GetStarted program?